Due to advances in mobile phones, mobile Web browsing has become increasingly popular. In this regard, small screens and poor input capabilities of mobile phones prevent users from comfortably browsing Web pages that are designed for desktop PCs. One of the serious problems of mobile Web browsing is that users often get lost in a Web page and can only view a small portion of a Web page at a time, not able to grasp the entire page’s structure to decide which direction their information of interest is located. To solve this problem, an effective technique is to present an overview of the page. Although prior studies adopted the conventional style of overview, that is, a scaled-down image of the page, this is not sufficient because users cannot see details of the contents. Therefore, in this paper, the authors present annotations on a Web page that provides a functionality which automatically scrolls the page. Results of a user experiment show that annotations are informative for users who want to find contents from a large Web page. Due to the advances in data-processing and communication technologies, mobile phones are now widely used to access the Web. However, the small screens and poor input capabilities of mobile phones, such as a direction pad and telephone keypad (laid out in a 3 4 grid and allocating numbers and letters for text messaging), cause difficulties for Web browsing because the sizes of Web pages are much larger than those of mobile phone screens. One of the serious problems in mobile Web browsing is that users often get lost in a Web page. Since mobile phones can present only a small portion of a Web page, users cannot grasp the entire structure of the page, and thus users cannot predict where to find the contents of their interest or decide which direction to scroll. In the user experiments conducted in our previous studies (Arase, Hara, Uemukai, & Nishio, 2007; Arase, Maekawa, Hara, Uemukai, & Nishio, 2007), we confirmed that presenting an overview of a Web page is crucial for Web browsing using mobile phones. The conventional method for overview presentation is to show a scaled-down page that fits a mobile phone's screen (Chen, Ma, & Zhang, 2003). This method is effective to some extent, by allowing users to view the overall structure of the page at a glance. However, since it scales down the page to fit the mobile phone's screen, it is too small to show the details of the content. Some participants in our previous user experiments commented that they could not see the details of the contents in Web pages, which disturbed them as they looked for the information they needed. Therefore, in this paper, we aim to find a more effective way to show the overview of a Web page. The main obstacles in Web browsing using mobile phones are the limited screen sizes and input capabilities, and thus we need to solve them while presenting an overview as well. To compensate for the limited screen sizes, we propose showing annotations on the overview, which indicate what kinds of information are in the focused contents. Since the amount of text included in the content is small, it is impossible to extract reasonable annotations by only using this text. Therefore, we collect linked pages and use the TF/IDF method to detect characteristic terms of the content and present them as annotations. 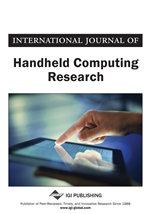 As for the limited input capabilities, the auto-scrolling method (Maekawa, Hara, & Nishio, 2006) can greatly reduce the number of operations by automatically scrolling the mobile phone's screen on Web pages. Auto-scrolling also has the effect of showing an overview of the page, since it makes paths that scroll the entire page through and users can passively view the page structure. We propose a method that combines these presentation methods. We should note that we refer to a mobile phone as one that only has a small screen and poor input capabilities, i.e., a direction pad and a telephone keypad. Although a group of more advanced phones, generally called smart phones as represented by the iPhone (iPhone) and the BlackBerry (BlackBerry), are becoming popular with their larger screen and rich input capabilities (such as a touch screen and gyro-sensor), most portable phones used in the world are still the conventional types. Furthermore, even though smart phones have larger screens and richer input capabilities, they still suffer from the same issues due to the small screens inherent to portable devices. Therefore, our overview presentation methods are also effective on smart phones to some extent. We conducted a user experiment with 20 participants to compare the proposed overview presentation methods with the conventional methods that show scaled-down pages and provide auto-scrolling functionality; this was done to investigate their characteristics and advantages/disadvantages. The experimental results show that annotations are informative for users as a guidance to grasp which direction to scroll to find the information of interest. Although auto-scrolling is effective to reduce the number of operations, it turned out to be insufficient by itself, since users have to follow the moving screen and read each text inside a content carefully. The results of the questionnaire survey show that auto-scrolling can be used to supplement annotations, e.g., users can choose auto-scrolling when they get lost in the page and feel tired of manual scrolling.